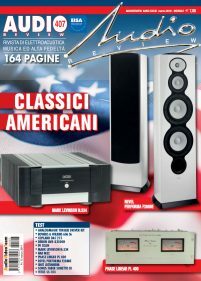 Founded in 1981 by engineers and audio critics decided to enter worthily high fidelity within electro-acoustics, AUDIO Review features reports of audio products of every kind, based on technical knowledge, listening tests and laboratory measurements, with the aim of guiding readers to the models that offer the best quality in their price range, from the most popular and affordable consumer devices to the exclusive high end components and for professional use. Not least is the music section, with over 100 reviews of new releases written by respected signatures. Recently AUDIO Review has expanded with the inclusion of ACS AudioCarStereo, AudioCostruzione and Digital Video Home Theater magazines.